3.) the evidence shows that the all-in cost of wind power, including the costs imposed on reliable power plants—as opposed to subsidized prices wind producers receive—is significantly higher than the cost of electricity from existing nuclear, hydroelectric, coal, and natural gas plants. In short, the idea that wind power is cheaper than coal power falls somewhere between a meaningless statement and a myth. Wind turbines only generate electricity when the wind is blowing, and it is a fact of life that the wind is an inherently unreliable source of energy. Wind power’s intermittency is a well-known limitation and a significant drawback, especially because the large-scale battery storage required to make wind a reliable resource isn’t commercially viable. Nevertheless, wind advocates breeze through the fundamental problems of intermittent, unreliable energy and attempt to sell the idea of a wind-fueled future on the fiction that wind power can compete head-to-head with reliable sources of power like coal, nuclear power, or natural gas. In fact, the Politifact piece specifically mentions the argument that “wind-generated electricity can’t (or shouldn’t) be price-compared to electricity generated by fossil fuels or nuclear sources.” However, it appears that critical point did not sway Politifact, given the “true” rating it assigned Obama’s comment. We should note that the argument was put forth by the co-author of a groundbreaking IER study on the cost of electricity, Tom Stacy, who was involved in a lengthy email conversation with the Politifact author attempting to convince him such a comparison (of wind to coal) is bogus. 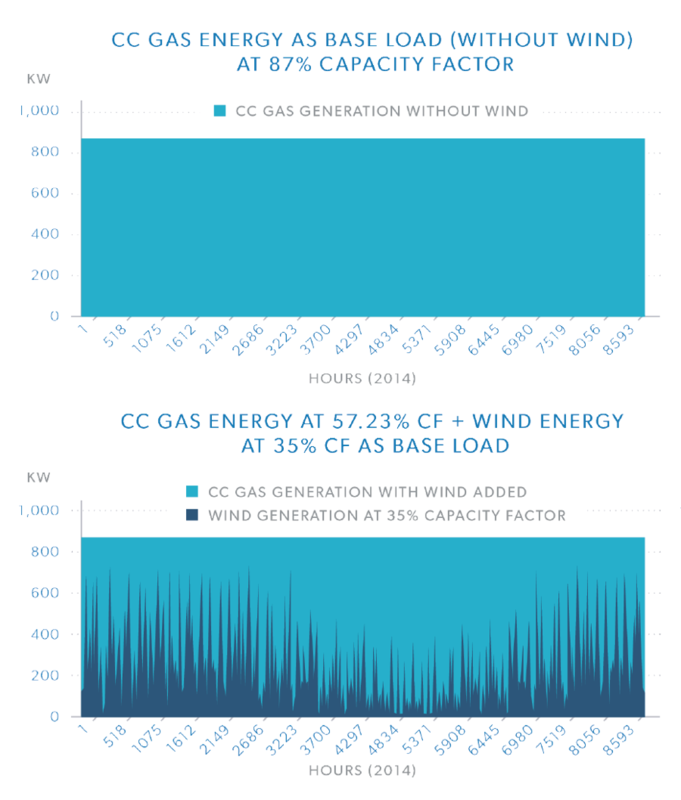 Because wind cannot dispatch power in response to demand, the electricity it produces is less valuable, and its cost should not be compared directly against dispatchable resources like coal, nuclear power, or natural gas without serious caveats or significant adjustments to factor in the cost of battery storage. Last year, IER released a report on the levelized cost of electricity (LCOE) from existing generation resources, a first-ever look at the LCOE of the existing sources on the grid as opposed to new resources. Crucially, the report also introduced the concept of the “imposed costs” created by intermittent resources. The report went one step further and estimated those costs under modeled scenarios to find that one megawatt-hour of wind production imposes a cost of $29 on dispatchable generation from natural gas plants. The concept of imposed costs is not intuitive, so here’s an example. Suppose a power grid consists of only combined cycle natural gas plants that are allowed to operate freely and satisfy the second-by-second electricity demand on the system. Then, even though the system has enough dispatchable capacity from the natural gas fleet to meet demand, we decide to introduce new, intermittent power from wind turbines. The phenomenon is shown graphically below. New wind production causes the natural gas fleet’s capacity factor to drop from 87 percent to below 60 percent. The imposed cost of wind power in this scenario is nearly $30/MWh, a cost that should be attributed to wind. The summary table of our LCOE report shows that, when the imposed costs of intermittent resources are taken into account, the LCOE of wind is not competitive with other new sources—especially combined cycle natural gas—and is nowhere near competitive with existing coal, nuclear, hydro, and natural gas resources. 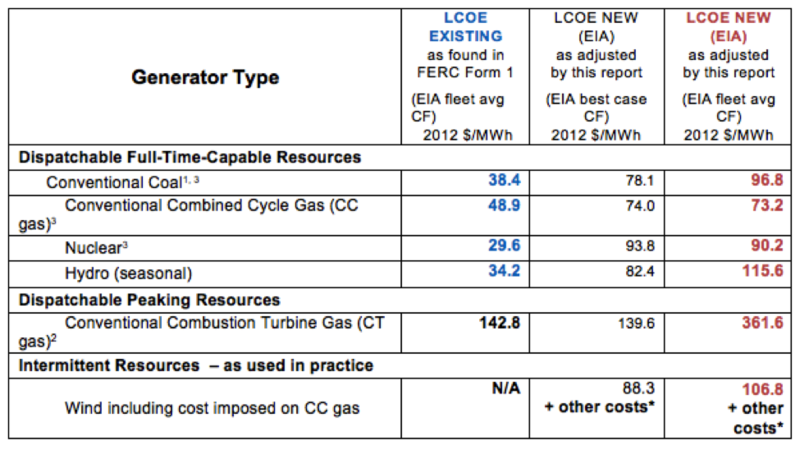 By accounting for imposed costs and adding them to the LCOE for wind power, IER’s report allows for more accurate comparisons between dispatchable and non-dispatchable sources. Under a true apples-to-apples comparison, new wind resources are nearly three times more expensive than existing coal resources. The article also overemphasizes the importance of wholesale prices for wind power. Wholesale prices don’t take into account the lifetime costs of building and operating a generation resource, nor do they factor in the multiple subsidies that wind producers receive (e.g., federal wind PTC, accelerated depreciation rules, federal loan guarantees, Renewable Energy Certificates, state and local utility property tax rebates). U.S. Energy Information Administration, Levelized Cost and Levelized Avoided Cost of New Generation Resources in the Annual Energy Outlook 2015, June 2015, pp. 1–2, http://www.eia.gov/forecasts/aeo/pdf/electricity_generation.pdf. The report calculates and includes the cost imposed on conventional combined cycle natural gas power plants. See, Thomas F. Stacy and George S. Taylor, The Levelized Cost of Electricity from Existing Generation Resources, Institute for Energy Research, pp. 1, 9, June 2015, https://www.instituteforenergyresearch.org/wp-content/uploads/2015/06/ier_lcoe_2015.pdf. Stacy and Taylor, The Levelized Cost of Electricity from Existing Generation Resources, p. 11.